Thera - Although not as famous as the Vesuvius eruption of 79 A.D., the Thera eruption in the 15th century B.C. was many times larger, and more significant to the development of civilization. 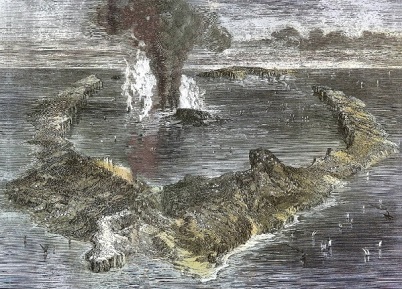 In fact, it is the second largest known eruption in recorded history (the Tambora eruption of 1815 is the largest). Its significance stems from the fact that it almost completely wiped out Minoan civilization which was concentrated on the island of Crete, and allowed for its eventual replacement by Mycenaean civilization on mainland Greece.